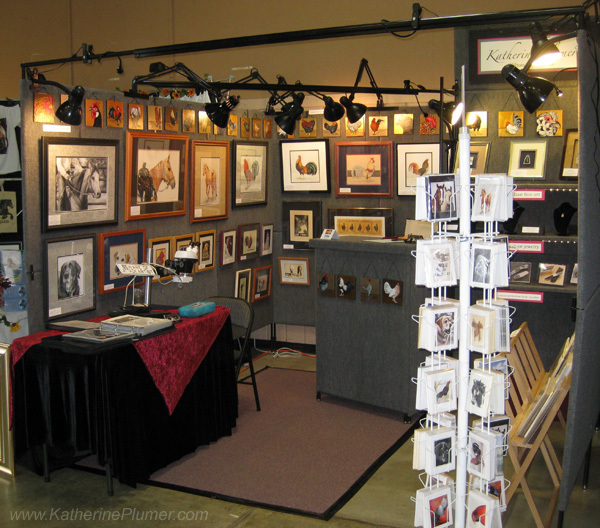 So, as I said in a previous post, I was up in Grass Valley over the weekend at the Draft Horse Classic, showing my art in the "Art at the Classic" show. I don't remember when I first started going there as a visitor, I'm thinking probably when I was in junior high school. 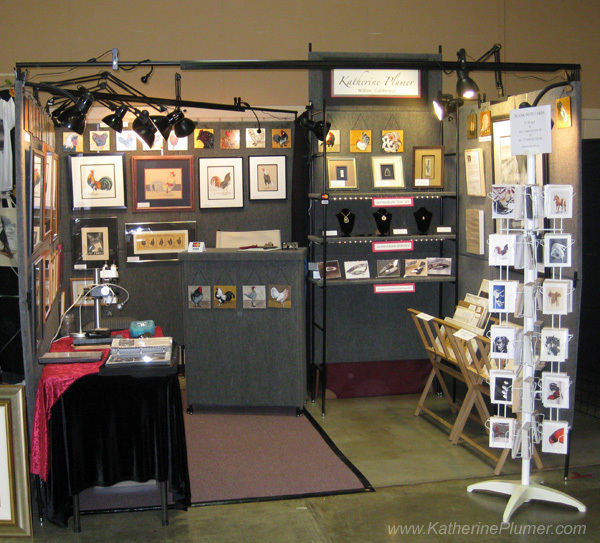 I started showing my art there in 1998, and first had a booth in 2002. It's my favorite show, I just love it! After missing the previous two years, I was soooo happy to be back. I had one piece in the competition, a little scrim called "Waiting for the Boss." 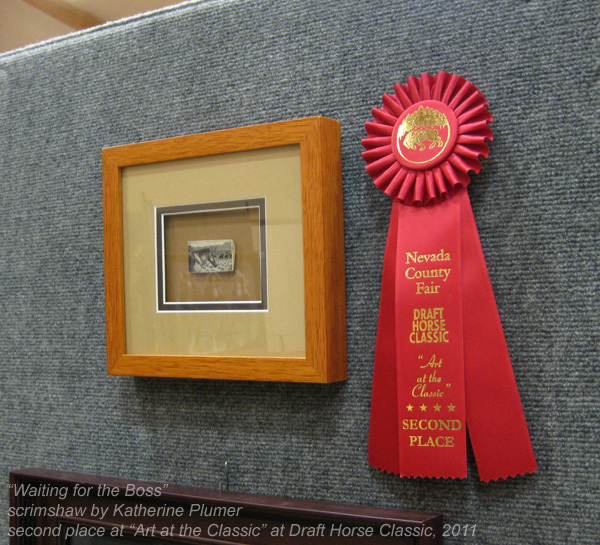 It got second place, woo hoo! I spent a fair amount of time sitting at the microscope working on scrimshaw, which is hard in that situation, and of course I didn't get all that much done because I spent a lot of time talking to people, explaining scrim, and selling things! I'm glad I brought that stuff though, people were really fascinated with the scrimshaw, and every person who I manage to educate even a little bit, well... it all helps. To my extreme delight, this was actually the best show I've ever had. Yay! Maybe there's hope for the economy after all? And again, the chicken art is what brings the people in! Gotta update my website soon and put "sold" on a few originals! Lots of people came to visit me at the show. Thank you to all of you, you know who you are, you're very special to me. :-) And one of the highlights for me was seeing some faces I hadn't seen for a LONG time. I had been thinking about how much I missed some of the artists who used to show there when I started out in 2002, back when I was a "newbie". 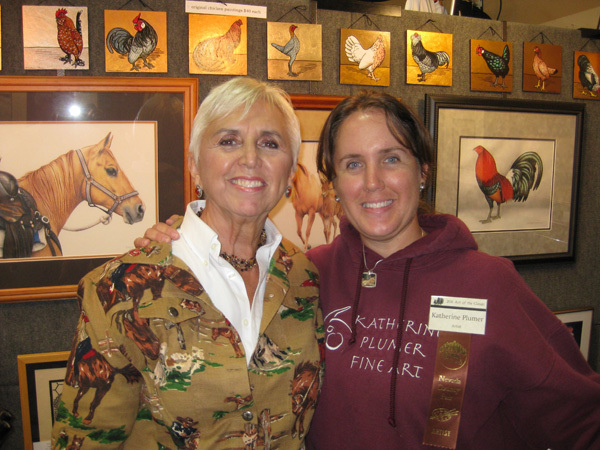 Well several of those artists happened to visit the show this year, and it was sooo good to see them! Here's me and Ruth Deoudes. 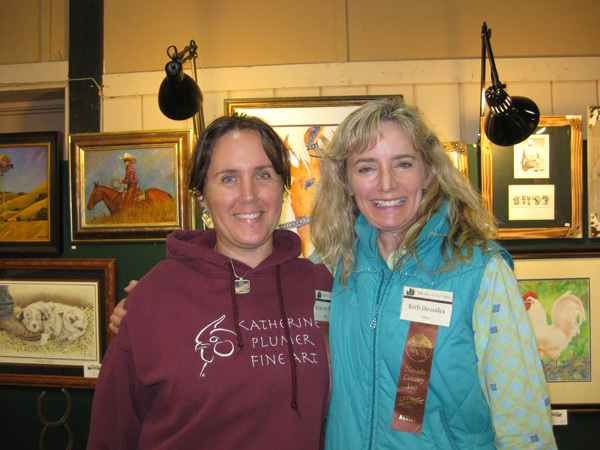 She was my first booth-neighbor back in 2002 and we instantly struck up a friendship. She still shows there, and even though we only see each other once a year we're great friends! I am so glad the show turned out so well! I am bummed I didn't make it like I had hoped. 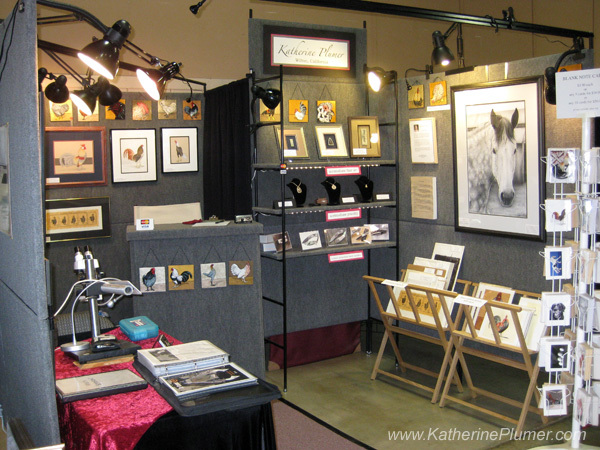 You know, you really do have a nice booth - I like how the walls and lights showcase your work. I think I have missed it each time you tear it down, so I am not sure how it all comes apart. Are the walls heavy? Ok. I am a dork, haha. Serves me right for posting first before making it down to the next post and reading that one....I answered my own question! Hehe.